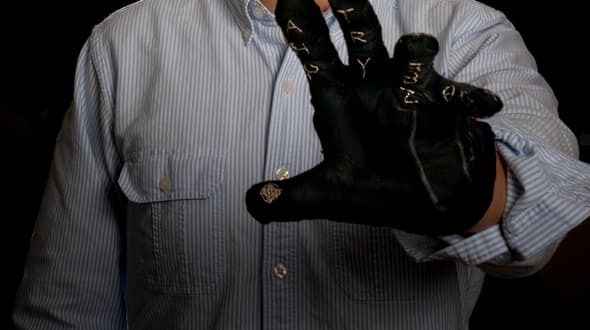 A group of students at the University of Alabama in Huntsville have used their human factors expertise to place a keyboard on their hands – literally. They’ve design the Gauntlet Keyboard, a glove device that function as a wireless keyboard. Consider it a touch screen that works by tapping your fingers to your thumb on a gloved hand. Points on the glove’s fingers are assigned a letter or other keyboard function. Conductive thread carries the commands to a matchbox-sized printed circuit board on the back of the glove, which transmits the directions via Bluetooth. Bluetooth links to a computer, mobile phone, music synthesizer, video game or other device. Engineers are notorious for acronyms, and Gauntlet is an acronym for Generally Accessible Universal Nomadic Tactile Low-power Electronic Typist. Liu said the inspiration came from science fiction movies and experience with touch-screen technologies, which helped revolutionize the mobile phone market. The team researched the most frequently used characters on a keyboard. Common keystrokes got the easiest finger-thumb alignments like the fingertips. Less common ones required more hand contortions. Apart from the obvious consumer market, the Gauntlet could have several applications, Liu said, including use as a musical instrument for digital synthesizing and use by people whose disability limits them to using one hand.